I finally popped a can of this stuff and glad I did...yum yum. I have a bias going into any McClelland blend and that is I expect a lot which given that I am not neutral can hurt the review or help it. Because I have high expectations when trying a new blend by them I suppose I can be let down easily but not with the case of Anniversary...its pretty darn delightful! I am a sucker for marketing so the packaging is top notch here, wax seal...common got to love it. Tin smell is a tangy mild ketchup not quite as ketchuppy as the Frog but noticeable. This is a well behaved smoke, packs well and burns consistently after initial scaring. On intake you get the mouth watering tangy Virginia and exhale the cool-smoking Cyprian Latakia which tames the Virginia quite nicely without destroying it. This is a one-two punch smoke and could be an all dayer no problem. 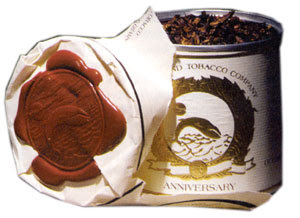 3000 are packaged in commemorative paper wrapped tin sealed with wax. there may be anadditional run of 3000 tins without the paper and wax.